The demand for European patents grew again in 2015 reaching a new high of nearly 279 000 (in 2014: 274 000, +1.6%). The figure is an indicator of the growing demand for patent protection from businesses worldwide. The EPO’s 2015 annual report, published on 3rd March 2016, also shows that the number of European patent applications (files for which applicants have actually requested a European patent at the EPO) increased to 160 000 last year (in 2014: 152 700, +4.8%). This increase was fuelled mainly by companies from the US (+16.4%) and China (+22.2%). The volume of applications originating from the 38 EPO member states remained almost stable last year (+0.7%). In addition to the innovative capacity of US businesses, the strong growth in applications from the United States is also due to the effects of a change in US patent law. The top five countries of origin for European patent applications in 2015 were the US, Germany, Japan, France and the Netherlands. In response to the continued growth in demand for patent protection in Europe, the EPO has taken significant steps in the past few years to modernise its internal structures and increase efficiency, while further improving its patent quality. These cover such diverse areas as cooperation with the member states, the EPO’s IT infrastructure and human resources policy. 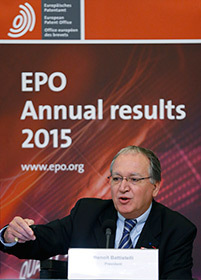 The 2015 annual results show that the reforms are paying off: The number of products (such as searches and examinations) delivered by EPO patent examiners grew by 14% in 2015 to 365 000; and the EPO published more than 68 000 granted patents, an increase of nearly 6% over 2014, and the highest number ever. Our grant process continues to be very rigourous, with only 48% of the applications filed becoming a European patent. Medical technology was once again the field with the highest number of patent applications at the EPO in 2015, growing by a further 11% over 2014. Other areas which showed significant growth were “Engines, pumps and turbines” (+18%) (where many patent applications in clean energies are filed), “Pharmaceuticals” (+10%), “Measurement” (+8%) and “Computers” (+8%). With regard to the company ranking, Philips moved into the top spot in the list of companies with the most patent applications at the EPO in 2015. Samsung ranked second, followed by LG, Huawei and Siemens. The top 10 was made up of four companies from Europe, three from the US, two from Korea and one from China. With four companies in the top 20, Japanese enterprises also figure prominently among the largest applicants at the EPO.